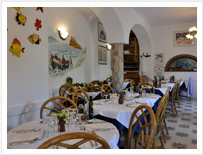 At the Casa Giuseppina hotel, every day you will have a rich buffet breakfast to satisfy all you desires: meats, cheese, eggs, fruit juices, jams, fresh products, homemade cakes, yogurt, cereals, fresh fruit and syrup corner. Lunch upon request (extra and a' la carte) and dinner are served at the table and you can order dishes different from the menu of the day. 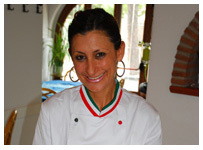 Besides we have been members of the Italian Celiac association for years and can satisfy all the most common food intolerances and our vegetarian guests’ requests. 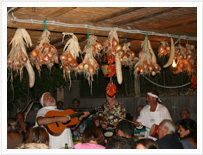 On regular basis, we have funny themed evenings in our garden with grilled fish and meat, typical island products, Ischia wine and traditional music. Among our offers, one of the most famous is the August Bank Holiday Party with rich dishes in a happy and friendly atmosphere.